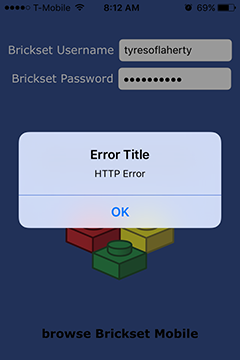 Brickset app not connecting on iPhone? I have that problem on my iPad all of the time. I gave up and uninstalled it. Which app is it? It's possible that it's not been updated to use v2 of the API; v1 was retired after giving developers a years' notice at the start of Jan. I'm using v2.5 on my iPhone 4s. Which app, not which version, there are loads of iOS apps, none of them 'official'. 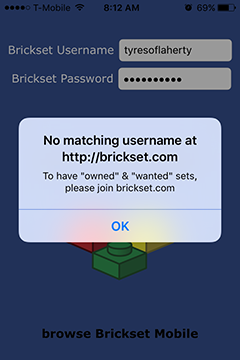 Oh, my bad, it's called Brickset (I didn't know it wasn't "official") ... it's the one by Kellino. Contact the developer about the problems, I think it needs updating. I believe I've been emailing him (and everyone else who uses the API) about the need to change so not sure why it's not been done yet. Yeah, I've emailed them too, haven't heard anything back yet.